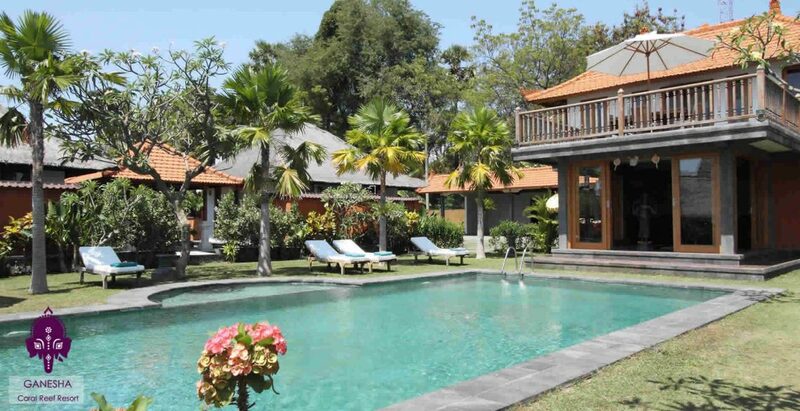 Ganesha Coral Reef Resort is situated directly on the beach with beautiful coral reef in front! 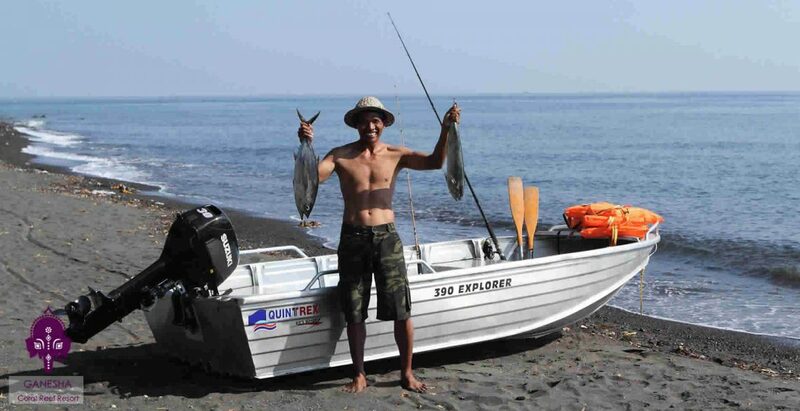 Ganesha Coral Reef Resort is situated in Uma Anyar directly on the beach at a huge tract of pristine coastal land. Here beautiful rice fields meet the ocean and there is a coral reef with an abundance of fish and marine life just in front. You will become in tune with the cycle of nature. The rice you eat comes from rice fields on the property. The fish comes fresh from the ocean. Fruit comes from the orchard. 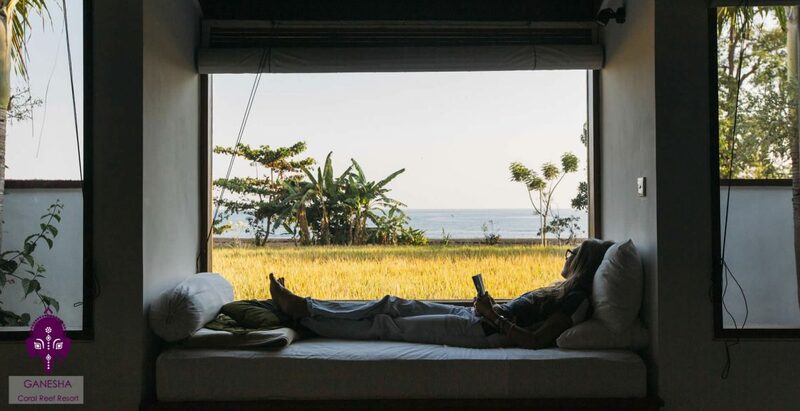 Herbs – both medicinal and culinary – come from our garden.The sacred Pule tree with the ocean temple beneath that radiates an all-encompassing sense of purpose and calm, sets the mode above anything else. 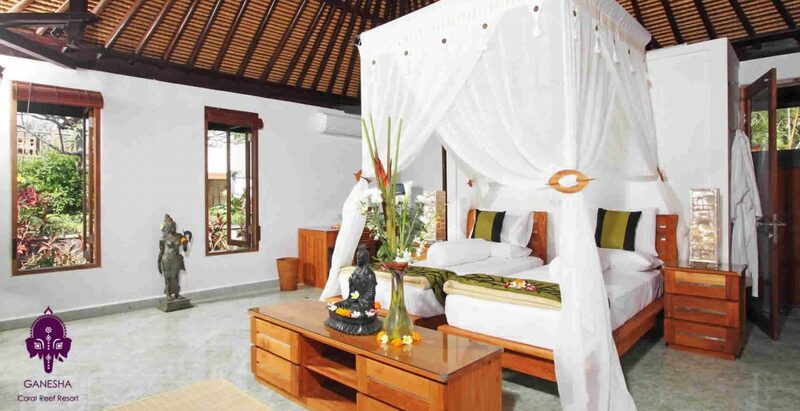 Ganesha Coral Reef Resort has been constructed honouring local Hindu customs. Each member of staff comes from the local village. You will feel like you’ve made heart-felt friends by the end of hour stay. Our staff brings every meal to you with a smile. 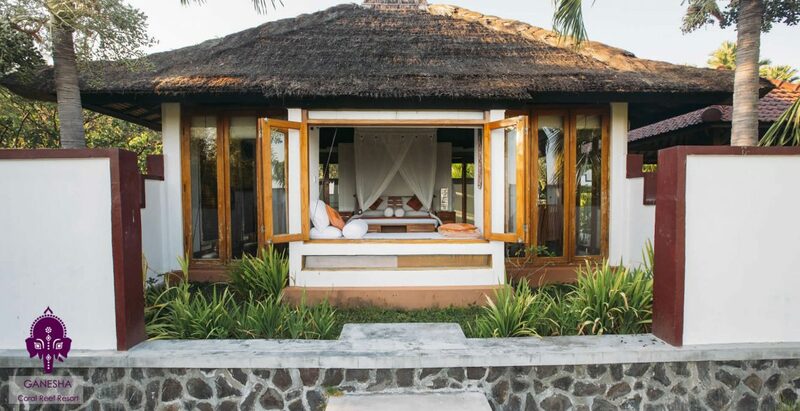 The Balinese innate sense of calm adds to the overall tranquil experience. The gardens have tropical plants including bursts of pink and red bougainvillea. Grass and the sweet smell of frangipani trees surrounds the infinity pool. Local Balinese staff tends to the rice fields between the villas and the beach. The local village and our guests share the produce of the rice fields. Furthermore we will take care of all your needs, starting from the moment you set foot off the plane. This will enable you to indulge yourself in the experiences that follow. Finally the spa centre on site offers a range of pamper packages. These include massage, body scrubs and wraps, facials, manicures, pedicures and a spa with high velocity jets for aqua therapies. © 2019 ganesha-bali.com, all rights reserved.